Directory services have long been on-prem pieces of IT infrastructure. However, many IT admins have found themselves looking for a cloud alternative. The question is, is it possible to have virtual directory services? The answer is yes. A new generation of cloud identity management platforms is emerging, and JumpCloud® Directory-as-a-Service®, a virtual directory service, is leading the way. The category of directory services was first enabled by the introduction of the lightweight directory access protocol (LDAP). This protocol was created at the University of Michigan by Tim Howes, one of JumpCloud’s advisors, and some of his colleagues. Shortly after its creation, the modern age of the directory began. From this protocol, two of the most popular directory options have appeared: OpenLDAP™, which became the most popular open source solution, and Microsoft Active Directory®, which became the most popular commercial option. These two solutions were designed to make it easy to connect users to the IT resources they needed through the centralized identity provider. They granted IT admins the ability to manage different resources in their organization, and made it easy to keep track of who had access to what. AD was the best choice for on-prem Windows-based networks, which nearly all enterprise setups were in the early 2000s, and OpenLDAP worked well in more technical Linux-oriented situations. These solutions worked, and for a while admins were able to handle all of their management needs with ease. But, as we all know with technology, nothing stays the same for very long. As the IT landscape shifted to a heterogeneous, cloud-based environment, the legacy directory services solutions struggled. Mac and Linux devices were difficult to manage. Cloud infrastructure was off-prem and required extra security and networking. Web applications often leveraged a different protocol than those supported by AD and OpenLDAP. All of these challenges and more started to build up, creating pain points in IT admins everyday life. The result of all of this change was a disjointed identity management strategy, and a much higher risk of compromises. Of course, the modern IT network also ended up meaning less control for IT and a great deal more work. The further IT got away from the Microsoft exclusive environment of old, the less AD was able to touch. Third party solutions came by to help, but added complexity, expenses, and additional workflows to keep everything in place. This obviously is not the type of setup that admins want to work in. Not only are there necessary workarounds and challenges that need to be tackled, but their organizations are less secure and flexible. 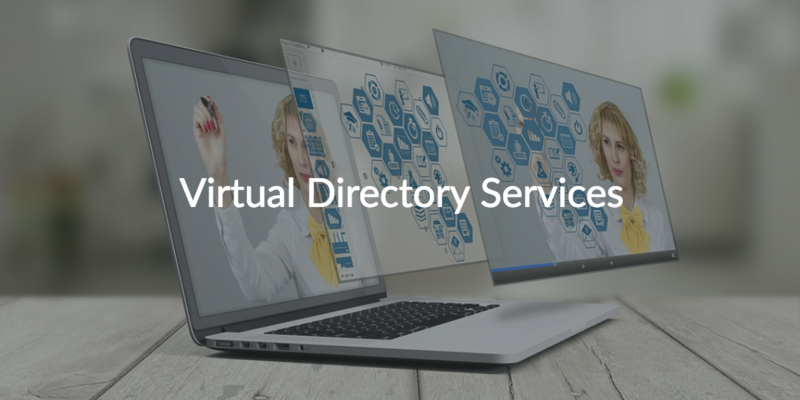 It’s these reasons that have caused many admins to start looking for a virtual directory service that can help them regain control over the enterprise. A new generation of cloud identity management solutions is emerging to solve these challenges that IT admins are facing. This cloud-based directory, called JumpCloud Directory-as-a-Service, is connecting user identities to the IT resources those users need regardless of platform, provider, protocol, and location. This solves all of those previously mentioned challenges, makes it easier for IT to manage users, and allows admins to spend more time on their company’s core mission. As a virtual directory, the JumpCloud platform is providing centralized user management, cloud LDAP, virtual RADIUS, system management, True Single Sign-On™, multi-factor authentication, and much more to IT organizations. If you would like to learn more about virtual directory services, drop us a note. We would be more than happy to answer any questions that you might have, and to help you better understand all of the features of the product. You can also check out the platform for yourself by signing up for a free account. We offer your first 10 users free forever, with no credit card required, so there’s no reason not to give it a shot. Sign up today!